ROIP (Radio Over Internet Protocol) is where radios are linked together over an IP network. This might sound complicated, but it doesn't have to be. In its simplest form, a radio is connected via some sort of interface, to a computer, which in turn is connected to the internet or some private network. This is what is known as a "node". Not every connection has to have a radio, it can simply be a PC with a headset (for dispatcher etc) or even a smartphone. Two or more "nodes" form an ROIP network. 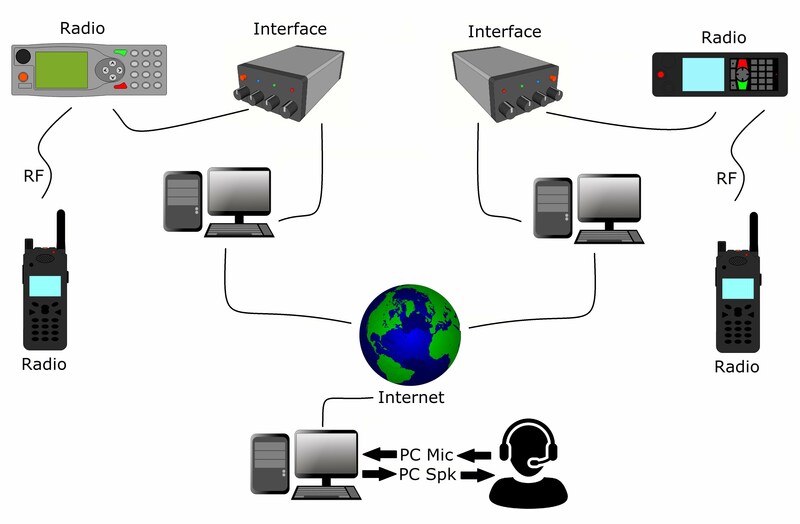 Users can be an infinite distance away from each other, and still talk, as the IP link bridges the gap. There are professional interfaces that can be assigned an IP address, and once configured, do not actually need a PC to be connected. These are specialist devices and cost upward of £300 each! I will try to stick to far cheaper ways of achieving the same thing.